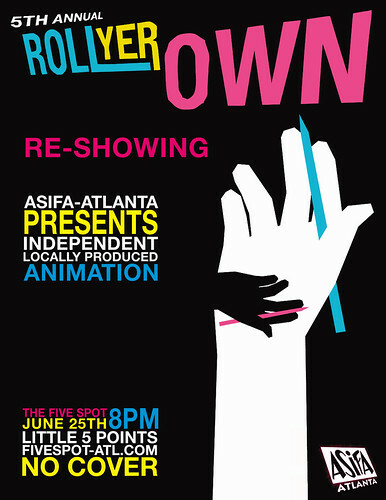 By popular demand, we've booked the Five Spot again for a re-showing of "Roll Yer Own"! June 25th, 8pm, Five Spot, free! And on July 14th at the Five Spot also for free we have "Blowin' Smoke"which will showcase Atlanta-produced commerical animation! This is an awesome opportunity to see what kinds of great animation local studios create and also meet the artists who make cartoons for a living. If you're looking for a job in animation, it might also be helpful! We're currently seeking entries for this event; any animation that was done for money is fair game! Association Internationale du Film d'Animation, or ASIFA, was started in France in 1960 as a membership organization for animation artists and now has 35 chapters around the world. ASIFA-Atlanta, started in 1995 and the only chapter in the South, offers animation screenings and educational programs year-round.